Recreational scuba diving is enjoyable and it is meant to be so. However, there is a fine line between fun-seeking and hedonism and without an essential sense of responsibility and an awareness of the risks, diving can easily succumb to a culture of pleasure‑seeking and self‑indulgence. Diving, just like driving, demands a clear mind and technical proficiency at all times. For the same reason, diving under the influence of alcohol or other intoxicating substances is decidedly unwise – both for the diver and for their dive buddies. So, here is a post-festive season reality check on finning under the fruits of fermentation and other intoxicating substances. It is common knowledge that alcohol impairs one’s ability to perform various mental tasks. Reaction time, visual tracking, concentration, performance of simultaneous tasks, judgement and psychomotor ability are all reduced following the consumption of alcohol . 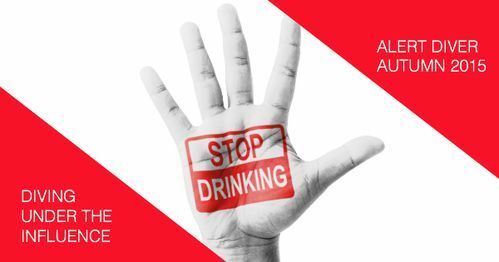 One would not expect any trained diver to deliberately dive while drunk, yet diving the morning after drinking the previous night may still mean that the diver is under the influence with an appreciable blood alcohol concentration (BAC). The liver has only a finite and individual-dependent capacity to metabolise alcohol. So, while the diver may not believe that he or she is impaired, the reality may be different. A study conducted on recreational divers doing shallow entry dives found significantly greater diving performance impairments with a BAC above 0.04% . These impairments were captured on video-tape and were confirmed by standard “dry” sobriety tests. This is not unexpected considering that cognitive impairment, including functions related to attention and concentration, can be reliably measured when the BAC is 0.02% and above . Perhaps more concerning, however, is that the divers in this study were not aware of their performance impairments or of the increased risk of injury possible from diving while under the influence of alcohol. The ingestion of even small amounts of alcohol impairs performance – these effects are noticeable even after one drink. The clearance of alcohol from the blood, at the predictable rate of about 0.015% per hour, does not necessarily equate to improved cognitive performance in the same time. Increased reaction time and decreased co-ordination follow a dose/response curve. In essence, the more alcohol that is consumed, the more impaired these functions are. Persons who have been drinking alcohol consistently underestimate its deleterious effects on their performance. Alcohol affects multiple attention tasks (like scuba diving) to a greater degree than those tasks requiring a single focus of concentration. In addition to impaired neurocognitive function, alcohol in excess results in a number of physiological changes that can endanger a diver. Acute alcohol intoxication can cause cardiac rhythm disturbances and can impair the heart’s ability to pump. Both are significant concerns even without the added problems of exercise or the underwater environment. Also, alcohol can directly increase the risk of diving accidents. Dehydration, a common consequence of alcohol excess, is a well-known risk factor for decompression sickness (DCS). Alcohol increases heat loss, by dilating blood vessels, which can lead to a diver suffering from hypothermia. Divers suffering from the effects of alcohol over-indulgence are also more likely to be nauseous and vomit during a dive; this not only ruins the dive, but can cause dehydration, impaired attention and an increased risk of a rapid uncontrolled ascent – all of which are known risk-factors for diving accidents. Lastly, in common with the two drugs also discussed in this article, alcohol can also make the diagnosis of diving medical problems trickier. While underwater, the soporific effects of acute alcohol intoxication are indistinguishable from the signs of nitrogen narcosis. However, upon surfacing, the common manifestations of alcohol intoxication, including inco-ordination, sleepiness, nausea and a headache may either mimic or mask the signs of DCS and so delay its diagnosis and its early treatment or these may result in unnecessary medical interventions being taken. According to research conducted by the Diving Diseases Research Centre (now known as DDRC Healthcare), 22% of divers admitted to using one or more illicit drug(s) since learning how to dive and 21% of these divers admitted to using a Class A drug, for example cocaine, or a Class B drug, for example cannabis, between five minutes and six hours before a dive . Cocaine is a stimulant, with effects that are apparent within five minutes of use and generally last for one to two hours, although the late phase effects can endure for a few days following a binge . In simple terms, the acute effects of cocaine can be harmful to the diver in two ways: Firstly, the effects on the central nervous system include mood elevation, impaired judgement and increased risk-taking behaviour. As discussed above, these effects are incompatible with safe diving. Secondly, the stimulation of the cardiovascular system increases the heart rate, blood pressure and the occurrence of abnormal heart rhythms. In the presence of increased physical exertion, these effects have been proven to be risk factors for sudden cardiac arrest. Cannabis appears to be the drug of choice amongst divers . The behavioural and physiological effects of cannabis commence within 10 minutes of use and, of significance to divers, can last for up to three to five hours . These effects can significantly increase the risk of diving accidents. As with alcohol, cannabis causes altered perception, relaxes inhibitions, impairs judgement and causes mood changes, which can all be compounded by the effects of nitrogen narcosis. Cannabis also causes vasodilatation of blood vessels, increasing the risk of hypothermia, and decreased motor co-ordination, impeding the ability to perform technical tasks. Smoking cannabis or tobacco increases the levels of carbon monoxide bound to haemoglobin in the blood, thereby reducing the body’s ability to transport oxygen by up to 10% . This can reduce the diver’s capacity for exertion and so impair his or her physical ability to respond to an emergency. In addition to the acute effects of cannabis, long-term exposure can also present problems for the scuba diver. As with smoking cigarettes, chronic exposure to cannabis can cause respiratory problems like chronic bronchitis and sinusitis, which increase the risk of barotrauma and its potentially lethal consequences. It is worth bearing in mind that the possession or use of Class A and B substances is illegal. Beyond the obvious threat of a criminal charge, the diver needs to consider how his or her medical funder might respond if such substance is thought to have played a role in the cause of a diving accident. It is not inconceivable that the payment for hospitalisation or recompression therapy may be refused. Perrine, M.W., Mundt, J.C. & Weiner, R.I. When alcohol and water don’t mix: diving under the influence. J Stud. Alcohol and Drugs; 1994; 55: p517-524. Koelega, H.S. Alcohol and vigilance performance: review.Psychopharmacology; 1995; 118: p233–249. Egstrom, G.H. Effects of alcohol consumption on aquatic performance. E&A News; 1996; 3: p2.